It was a very cold Friday morning in Paris when we gathered on the stairs of the magnificent Grand Palais for the shooting of the opening scene of «The Price of Desire ». We had joined the production team for the re-enactment of the auction of the Yves Saint Laurent & Pierre Berge incredible collection by Christie’s back in February 2009, where Irish architect Eileen Gray’s “Dragon Chair” achieved over 22 million Euros (19,5 millions plus commissions), a steep extravagant price ever paid for a 20th Century piece of furniture. Among the first time actors like myself who played a speaking role as a journalist, were many of the original attendees, notably Cheska Vallois of Galerie Vallois, who originally bid for the anonymous private client who bought the notorious chair, and who played herself, responding questions to the press as to the validity of the high price sticker “it can only be the price of desire…” – those famous words she enunciated outside the Grand Palais after the sale, that lent the title to this film. It was so cold I could see my breath when I nervously uttered my lines for the first time, and even when Irish director Mary McGuckian made us go up and down the stairs repeating the take relentlessly to get the best footage from all the possible angles, we could not warm up! We did it so many times I stopped counting, and when we thought we were done Mary would say, “It was really good, but let’s do it one more time!” She said it always with a smile, so we did it over and over again without complaining, until the takes were perfect and our lines sounded natural. 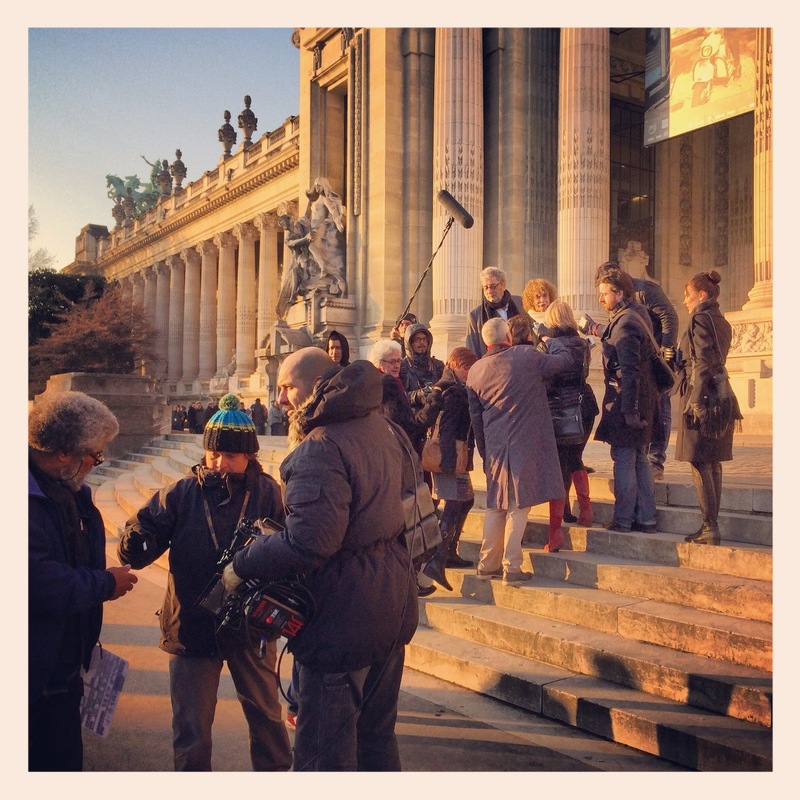 Award-winning filmmaker and Monaco resident Marco Orsini had also come to Paris with his crew shooting for his revisionary feature length documentary “Gray Matters” in association with Mojo Entertainment. No other than singer and songwriter turned photographer Julian Lennon was taking pictures that will be part of a limited edition print publication by Stoney Road Press. Julian showed me some of the photos he has been taking during the filming on different locations, and they are truly beautiful telling a story in themselves. Julian’s timeless photo on the right. After, a well deserved lunch break and hot tea, we joined the filming team and many of the original auction attendees at Christie’s on Avenue Matignon for the replication of the auction itself, but luckily this time we were inside. Among the participants for the re-enactment was Monaco resident Nancy Dotta who was playing herself taking bids on the phone as she had done in 2009. Many members of the international Eileen Gray community converged in Paris to pay their homage to the designer; academics, experts, furniture specialists, dealers and collectors who have collaborated with the production. It is important to mention also the presence of representatives of the Conservatoire Littoral, the Conseil General, the Commune of Roquebrune-Cap-Martin and the many members of historical architectural organisations associated with the site at the E1027 Villa, as well as representatives from the Centre Pompidou, The National Irish Museum, the Irish Museum of Modern Art, La Fondation Corbusier and ARAM Designs Limited (UK), worldwide license holders of Eileen Gray’s work. The long’s day work culminated in a reception generously offered by Mr Rory Montgomery, Ambassador of Ireland in France, in the beautiful salons of their period building on Ave Foch, with a concert by renowned Irish pianist Michel O’Rourke. Mary McGuckian thanked everybody in attendance specially the Ambassador for his gesture and support for the film and its associated projects. The Price of Desire tells the controversial story of how Eileen Gray’s powerful contribution to 20th Century architecture and design was almost entirely obliterated from history by the idiosyncratic Le Corbusier, and how her relationship with Jean Badovici further provoked a split between the two architects in both a personal and professional way. The film will set the facts straight and give Eileen Gray the recognition she deserves. Irish actress Orla Brady is just perfect and almost ethereal in the lead role of Eileen Gray opposite handsome Swiss actor Vincent Perez as her nemesis, Le Corbusier. When Perez is in character you actually cannot recognize him, as you can see in the photo below! Canadian actress and singer Alanis Morissette and the emerging Italian actor Francesco Scianna play Eileen’s lovers, the famous French singer, Marisa Damia and Romanian architectural critic Jean Badovici respectively. “The Price of Desire” is a European co-production between EG Film Productions Limited of Ireland and Saga Film in Belgium, in association with Fabrica de Cine and Katie Heidy’s US based Liberty Liquid Films and Rush River Entertainment. The film also has the support of The Irish Film Board, Bord Scannan na HEireann, the Irish S481 incentive program, BNP Paribas Fortis Film Fund with the support of the Media Production Guarantee Fund and Audiovisual Aval S.G.R. Director of Photography, Stefan Von Bjorn brings his technical mastery of digital cinematography and award-winning costume designer Peter O’Brien, dressed the period. Julian Lennon has created an exhibition level collection of stills, and portraits of the Lead Actors, as unit photographer. Production Designers, Academy Award Nominated Anne Seibel and Emmanuelle Pucci, create a revisionary aesthetic inspired by the modernist architect and designer. Golden Globe nominated Irish composer, Bryan Byrne is set to score for writer and director, Mary McGuckian, who is currently in post-production on the picture at Windmill Lane Pictures in Dublin. McGuckian is best known for directing “Man on the Train”, featuring U2’s Larry Mullen Jr, and “The Bridge of San Luis Rey” starring Gabriel Byrne and Robert de Niro. Keep tuned for more news on the epic film “The Price of Desire”, the documentary “Gray Matters” and the limited edition photo book and exhibition by Julian Lennon. How daring and exciting to hear of this film’s release. Great to see such collaboration!